On the evening of August 28/29 1942 Wellington DF665, took off on an opertaion against Saarbrucken. It was the first operation for the crew. At approximately 2300 hours the aircraft was attacked by night fighters. The bomber coming down at Petit -Doishe(Namur) on the border with France, some 2 km. WNW of the French town of Givet. Only Sgt. Ledford escaped, the other crew members were killed. On August 31st, he was led to Rienne (between Gedinne and Willerzie in the South of Beauraing) by an young man named “Ronald”. He stays five days at the home of Mr. Desire Paquay, a member of the underground who arranges escapes from the Rienne area. On September 5th, “Ronald” introduces Ledford to Félix, who takes him along to his parents to Liege. Where Ledford stays until the 17th. Their friend Nicolas Zeugers contacts an organization and William Ledford is moved to yet another house in Liege owned by Clara Quanten and later still the home of two sisters Jenny and Mathilde Ritschdorff also locatedin Liege where he met up with Philip Freberg who was there already. Together they would be guided to Brussels by an operative know as “Monique” (Therese Grandjean-Raison). Ledford leaves then later is followed by Freberg. On September 23rd, a guide leads him to Paris, where he is hidden at the house of Elvire Morelle located on Oudinot street, where he finds Freberg, Edward Heap and Robert Frost have already been in hiding. Together, they all leave Paris on the 6th with Elvire and Jeanine De Greef, who accompanies them until Urrugne, via the 7 Rue Salagoïty with Saint-Jean-of-Luz in Ambrosio San Vicente. They cross the Pyrenees with a Basque guide on the 26th passage of Comet. Ledford finds Philipp Freberg there. In a farm in Spain, they meet Andree De Jongh and go to San Sebastian in a mechanic (Bernardo ARACAMA , Calle Aguirre, Miramon, in San Sebastian). Ledford is questioned by the MI-9 on November 2nd." Sgt. 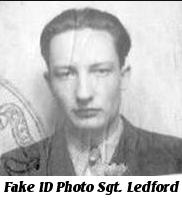 Ledford returned to England on November 2nd, 1942 and later returned to 419 Squadron on active service after a rest period. From April 26th until June 20th 1943 he flew as Navigator on the crew of Sgt. R.S. Harrison. He later was posted to 434 squadron and while on an operation to Leverkusen he was killed along with all the other crewmen of Halifax Mk.V EB255.